6 month Baby Food Recipes - Homemade Natural Foods! Home » Child Care » 6 month Baby Food Recipes – Homemade Natural Foods! 6 month Baby Food Recipes – Homemade Natural Foods! 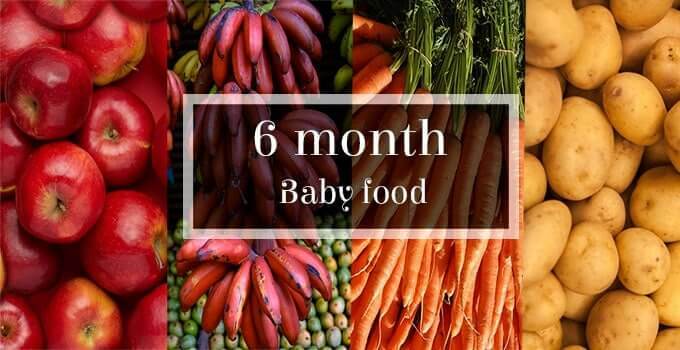 After 6 months, its time for your baby to enjoy solid foods. Remember solids should not replace breast milk. Both should go hand-in-hand to provide proper nutrition for your baby. 6 month baby food recipes include fruits, vegetables, fruit/vegetable puree, and cereal. Here I curated simple homemade 6 month baby food recipes which are traditionally practised. These natural foods should be more nutritious than commercial baby foods which are processed by chemicals. Traditionally in Tamil Nadu, baby is offered with rice water and dal water before starting solid foods. This is considered to be the first weaning foods. Rice/Dal water should not replace breast milk as it does not contain enough nutrients. You can give sips of rice water and dal water. Cereal is preferred to be the first baby food because it has added iron, which baby needs at this age. I started with 1 tbsp of rice water and increased day by day and gave it for a week. My boy completely enjoys it and had no allergic reactions. Take 3 tbsp of rice in a bowl and add water. Soak the rice for 15 to 20 minutes. Wash the rice in running water. Take a pan, add water 3 times that of rice (3:1) and boil the water. Once bubbles appear, add the rice cook it until it becomes soft. Later when the rice is cooked well, the water is strained and collected. Once the water has cooled to room temperature, you can give it to your baby. Energy-rich, nutritious and easy to digest. Moong dal water is considered to be the ideal weaning food to start with. Take 3 tbsp of moong dal in a bowl and add water. Soak the dal for 15 to 20 minutes. After 20 mins wash the dal in running water. Take a cooker, add water 3 times that of dal (3:1) and pressure cook for 3 to 5 whistles. Add another ½ cup of water and blend in a mixer till smooth. Strain the cooked dal mixture using a strainer. Moong dal is a great source of protein. As rice water suited for my boy I started giving it from thin to the thick consistency. Here I am sharing 2 combinations of rice porridge so that baby does not get bored. Soak the rice in water for ½ an hour. Wash the rice in running water and drain it. Now spread the drained rice on a white cotton cloth and dry the drained rice under the sunshade. After complete drying take a pan and dry roast parboiled rice for few mins make sure not to burn the rice. Switch off the flame and dry roast cumin seeds and ajwain in the heat of the pan itself. Powder all the dry roast ingredients together finely.Rice kanji/porridge powder is ready now. Take a pan. Add 2 tbsp of rice porridge powder and 1 cup of water and mix well so that no lumps are formed. Cook on low flame until it reaches a saucy consistency. After the consistency is achieved switch off the flame and allow it to cool. Now feed your baby with warm rice kanji/porridge. You can also follow the same procedure in the cooker by pressure cooking it for 3 to 5 whistles. Once the baby is used to plain rice porridge, the next is you can add moong dal along with rice porridge/kanji. Take one cup of moong dal and dry roast it for few mins make sure not to burn the dal. Now powder the moong dal finely. The Procedure for rice/moong dal porridge is similar to recipe 1. Once the baby is fine with cereal you can start with pureed foods. Peel, core and slice your apple into small pieces. Add the apple pieces to the pan, and then add enough water so that they are all submerged. Close the pan with a lid and allow it to boil in low flame. Once the apple is boiled it becomes so soft and transparent. Now mash the apple using spoon or potato masher. Now feed ur baby warm. NSome people say not to boil the apple as it may lose its vital nutrients and suggest directly to peel, core, slice and grind.But initially, I boiled the apples.From 7 months I gave it raw by grinding. I started with Red banana(Sevazhai Palam) for my boy. READ Dry Grapes Juice for Babies (Raisin Water) - An Amazing Home remedy! Peel and cut the ripe banana into pieces. Add little water and mash it well using a spoon or potato masher. After fruits start with vegetable puree I started with carrot and potato. It’s better to pressure cook carrots in cooker than in a pan as it takes more time. Pressure cook for 3 to 5 whistles. Mash the carrots using the potato masher. The Method is similar to apple puree. But remove the skin of the potato while mashing. Take a saucepan and fill with water, bring water to a boil. Add peas, cover, and cook until tender, about 15 minutes. Place peas and in a blender or mash using a potato masher and puree until creamy. Strain the mixture through a sieve to remove any lumps. The best time to start solids for baby is after the completion of 6 months. Is my baby ready to have solids? Baby should have good head control. Able to sit with or without support. Tongue thrust reflex – when the baby pushes the bottle out of his/her mouth or pushes food out. Apparently, your baby isn’t ready for solids if they are still doing this. Interest in food and watching others eat. Baby opens his/her mouth when food is offered and should be able to move food to the back of the mouth and swallow. Ability to let you know when full. Look for signs such as turning away from the bottle or breast. Baby is still hungry even after having required breast milk or formula for the day. Do not add salt, sugar and honey to any food until 1 year. Any food that is a choking hazard. Please be careful that you give only one new food at a time. Start giving a small quantity of solids in the beginning and increase it day by day. If the baby is allergic to a particular food discontinue immediately and wait for few more weeks before trying again. Remember that breast milk or formula is still the prime source of nutrition for your baby. Solid food is just a supplement. Make sure the baby is sitting in the upright position during the feed. Do not give solids in a bottle. Use a baby-friendly bowl and spoon to feed this soup. Sterilize baby’s utensils before use to avoid any contamination. Your baby’s first solid foods should be smooth with no lumps. Once you start solids, start feeding some amount of water also. It needs to be 40ml max per day.Many babies suffer from constipation once they start solids. Having water will not only keep the baby hydrated but also prevents from constipation. Do not feel pressurized by seeing other babies or listening to other mothers, who say that their babies were eating so and so much during this age. Always remember that your baby is unique and no two babies behave or feed in the same way. And unless there is a very good reason (sometimes there are medical reasons to do so), it’s best to avoid giving your child juice at this age. Even 100 percent natural fruit juice has a lot of sugar in it. Excessive sugar intake at this age has been linked to problems later on in life. Intake of sugar-sweetened drinks in infancy has been associated with double the risk of obesity at 6 years old. What’re your thoughts on these natural recipes of 6 month baby food? Let me know in the comment section below. If you find this post helpful, do share with mommies who are in need of this information. Thank you in advance. Hi charu thank u so much..Glad u liked the blog.And about starting solids its better to start in morning so that u can check for allergies.For 6 month baby 1 meal per day will do.For 7 months, increase by 1 meal every month.By 1 year baby should be eating 3 meals plus snacks.